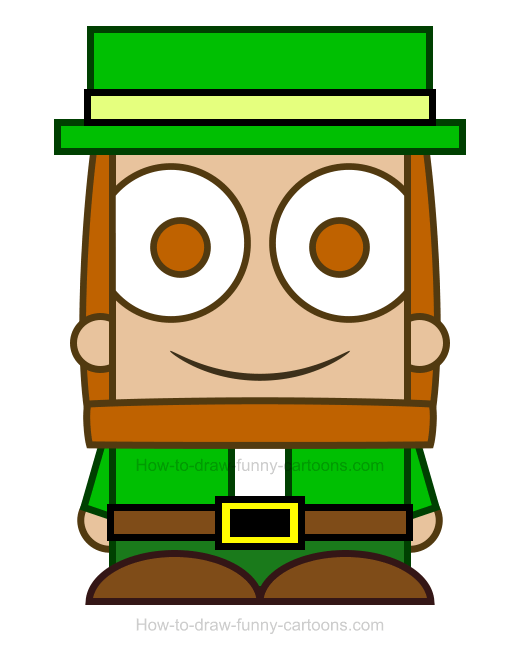 No need to be afraid of this cute leprechaun clipart! Everything is adorable about this fictional cartoon character that is usually feared by everyone. Indeed, this fun cartoon illustration can be drawn using only four steps that are accessible and perfect for beginners. I will show you how using simple circles and rectangles can end up with a fun cartoon illustration! It's true! No need to use complex shapes and patterns! Ready? Excellent! Let's draw this leprechaun now! 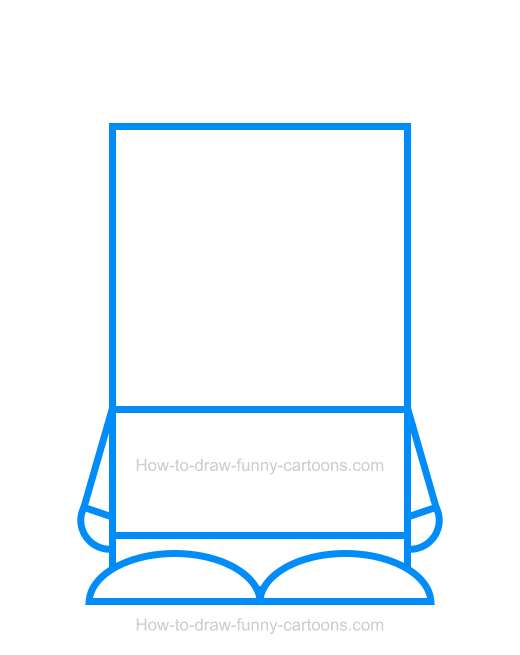 First, let's draw the head and the body of the cartoon character. You can start with a huge square for the head. The body is represented by a smaller rectangle. The legs are also smaller than the body and the feet are made from simple curved lines. Complete this step by drawing the arms and the hands as shown in the illustration below. 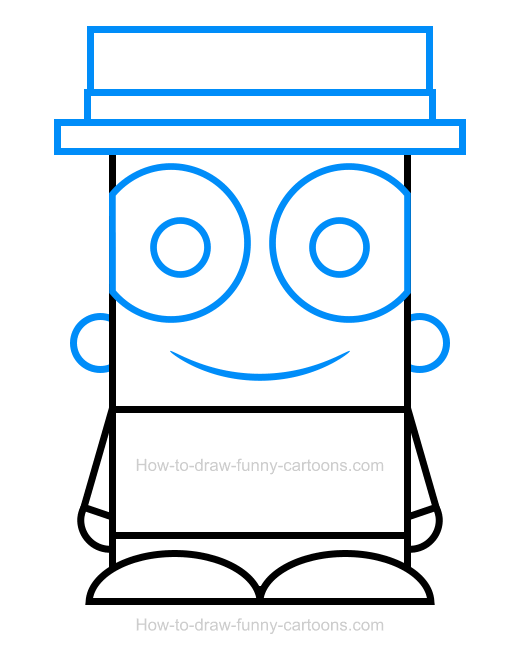 On top of the head, you can draw a hat using a large rectangle. A wider and thinner rectangle is added below the first one. A third one is used to illustrate the stripe on the hat. You can also add the ears, the eyes and the pupils using a series of circles. The mouth is done from a simple line. 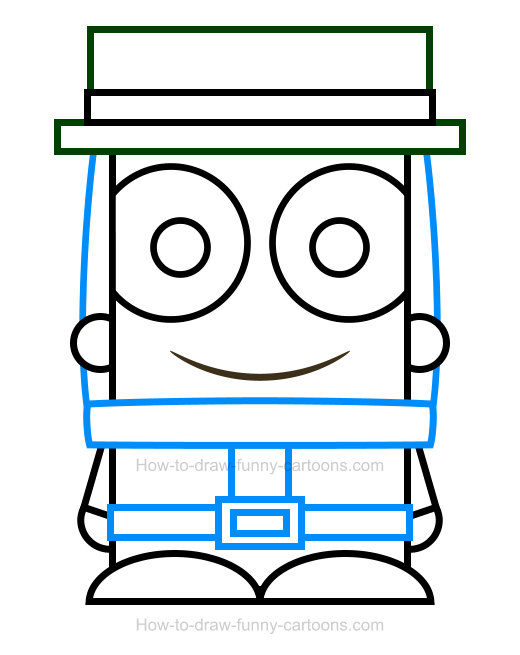 It's now time to add more details and make this cartoon leprechaun more recognizable. First, you can add some hair and a large beard using long and thin rectangles. A belt is also added on the shirt using once again a few rectangles. A stripe is also drawn on the shirt as depicted below. That's it for the drawing part of this lesson. Let's add colors to make this image even more special! The hair, the pupils, the shoes and the belt are all filled with a variety of brown colors. The hat, the shirt and the pants must be green. The middle part of the belt can be filled with black and a bright yellow color. The stripe visible on the hat is filled with a green color that is almost yellow. The stripe on the shirt must be white. Cool! 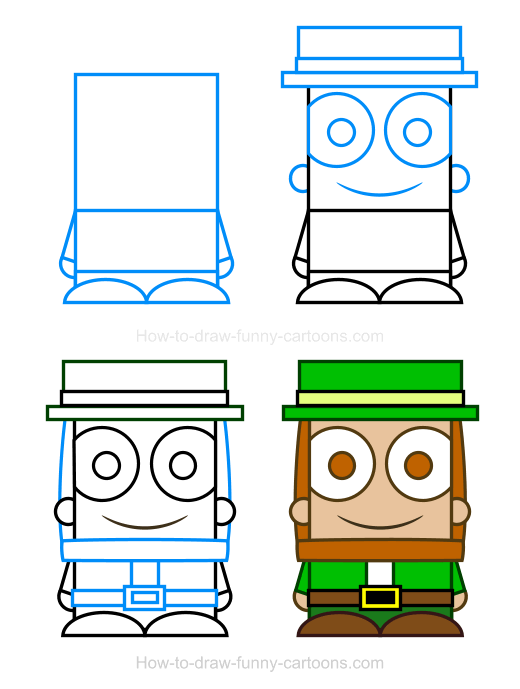 This fun leprechaun clipart is visually entertaining! Excellent work! This cartoon leprechaun is now completed. I hope you had fun drawing this adorable cartoon character. You can see all four steps below inside a single image. You are also invited to draw more characters from the same series here.